Star Trek: Discovery deals with the most recent shocking reveal while delivering an action packed Mirror Universe adventure. Episodes like this leave me torn. On one level it’s an incredibly entertaining episode of a TV show with well executed action, some great character moments and various conclusions that feel satisfying but it’s the sort of episode that starts to fall apart not long after the credits roll. Is that down to my tendency to overanalyse what I’m watching? I can’t deny that it’s a likely factor but then again that’s why I write these articles. Last week brought the -maybe not- surprise reveal that Gabriel Lorca was actually native to the Mirror Universe. The clues were always there and it is an easy explanation for him not being in line with traditional Star Trek values but I was hoping for something more complicated. As I’ve repeatedly said there’s nothing wrong with having a character who doesn’t share the same idealism as the others. During a War there is greater need for detached soldiers and Lorca could have been the sort of Captain who makes sense for War but has difficulty finding his place during Peacetime. Despite what I would have liked the truth has been revealed so that’s what I have to discuss. The reveal was an effective one in terms of the way it was staged and based on my memory of the previous episodes it seems to hold up when placed under scrutiny so it doesn’t feel like something thrown in at the last minute because someone decided it’d be a great plot twist. Something that is planned for is nearly always better than something that isn’t. I suppose the downside is that the audience could see the reveal coming from early on but avoiding that requires smarter writing than this show can deliver. The problem with answering the riddle of Lorca is that there is almost no time to digest the implications of it. This episode is pretty much all action with Jason Isaacs fully embracing the moustache twirling villain that Lorca now is. It’s not bad but it’s something of a disservice to a character who was previously defined by how calculating and manipulative he could be. He mentions that this long game has been played over the course of 1 year 212 days which is far too long a time compared to the haphazard approach taken to trying to overthrow the Emperor. Make no mistake, Lorca is formidable and clearly has loyal followers willing to die for him. 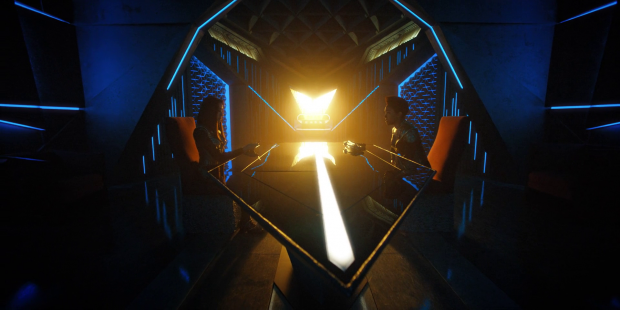 The implication is that Lorca inspires loyalty and has people who want to serve under him as ruler of the Terran Empire though it isn’t clear what he does to command this loyalty or what his plans really are. As such his cause feels somewhat empty and the ambiguous nature of the Mirror Universe makes it impossible to know who should win out of Lorca and Georgiou. Let’s not forget that Georgiou made Burnham select a Kelpien to be served up as dinner so she isn’t exactly the best option here. The only thing the viewer has to go on is that Lorca has been lying to Burnham -and by extension the audience- since she set foot on Discovery in a bid to manipulate her to achieve his singular goal of overthrowing Georgiou. 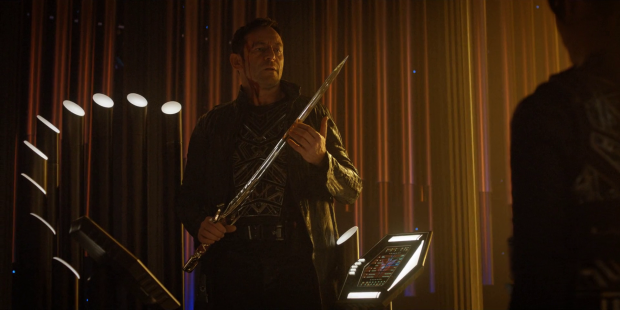 This gives Burnham a reason to hate him certainly and Jason Isaacs’ performance suggests that he’s a villain so the episode does the right things to signpost the fact that Lorca is the bad guy. Similarly Georgiou takes on a more thoughtful and pitiable persona designed to elicit sympathy from the audience. It may not be clever but it is effective and it indicates who the audience is supposed to side with for the purposes of the episode. 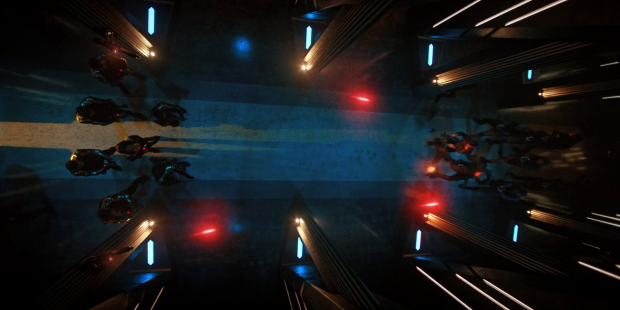 Most of the episode deals with the conflict between Lorca and Georgiou which consists of some really impressive action sequences such as a corridor shootout involving the use of personal forcefields and automatic turrets. There isn’t much encouragement to invest in this sequence because the only deaths are expendable henchmen and the direction is fairly chaotic so it’s difficult to pick out who’s winning at any given moment but it’s certainly creative, entertaining and new for Star Trek so it stands out for those reasons. The later hand to hand combat in the throne room is equally impressive and problematic for the same reasons. 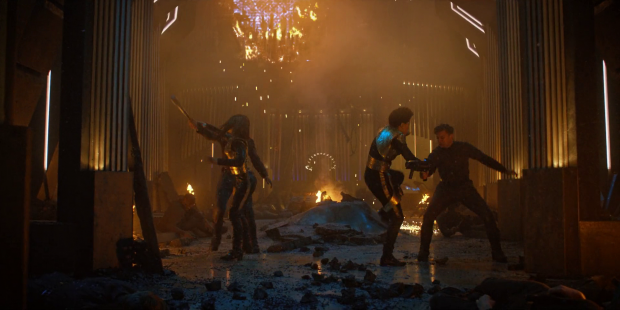 Star Trek: Discovery has a more modern approach to fight choreography making it believable that those involved are highly trained military personnel. Gone are the days of William Shatner leaping against walls and karate chopping his enemies until he wins. It’s an important step forward and makes for more cinematic action beats. It actually reminded me of a similar sequence in Star Wars Episode VIII: The Last Jedi. Seeing Lorca disintegrate while being exposed to the Mycelial energy is visually impressive so makes an impact on a purely visual level but the moment suffers for the same reason the rest of the episode suffers; a lack of suitable investment. Lorca’s death is ultimately meaningless because the character we have spent so much time with has been outed as a liar who isn’t who he said he was so we’ve had no time to get used to the honest version of this character. His rivalry with Georgiou is something that only really exists in this episode so her victory over him doesn’t mean anything either. All that can be taken from it is that a bad guy has been killed and that’s a good thing because he’s worse than the other bad guy that defeated him. I also can’t help but lament the fact that this could be it for Jason Isaacs on this series, certainly as this version of Lorca and that’s going to be a big loss for the show considering how engaging he was up until now. All we can say about his death is that it’s designed to be a shock because the expectation from the audience is that the writers would find some excuse to keep him alive. I’ve mentioned that this episode portrays Georgiou in a more sympathetic light. This is accomplished through focusing on the similarities she has to the version that the audience experienced at the start of the season. This attempt lives or dies on Burnham’s relationship with her and the episode does a good job building this. It’s clear that Burnham is projecting her feelings of guilt and regret onto this version of Georgiou in an attempt to find a sense of personal redemption. She mentions that Georgiou was betrayed by a Michael Burnham in both universes and refuses to repeat that when she has the chance to make a different choice. On a purely sentimental level this works with the performances of Sonequa Martin-Green and Michelle Yeoh doing a lot of the heavy lifting to make this believable. In essence both characters see this as a way to make up for the mistakes made in the past so this becomes the foundation for their relationship in this episode. The problem with this is obvious. Georgiou isn’t the woman that Burnham knew and still willingly sent a Kelpien to its death to be served up as food. That is a factual description of something she did which is no doubt one of innumerable horrible acts she has ordered in her tenure as Emperor. Burnham seems to quickly forget that because Georgiou reminds her of her former Captain and mentor. From a characterisation point of view this makes some degree of sense though I would have liked to see Burnham more conflicted over her feelings in this situation. The rational part of her brain will know that this Georgiou isn’t her Georgiou but the similarities may make this difficult to keep in mind. Another possible angle would have been Burnham weighing up which side was least evil and most likely to secure her escape before deciding that Georgiou was the better option. The writers chose to make Burnham’s decision a sentimental one which doesn’t feel consistent with her character. Her decision to bring Georgiou back to Discovery with her both makes sense and doesn’t. Within the context of the episode itself and the relationship developed in this specific outing -and a little of last week- it’s reasonable that Burnham would want to save Georgiou for all the reasons I’ve mentioned. It does ignore the fact that she isn’t the Georgiou Burnham knows and fails to factor in the problems having a Mirror Universe duplicate trying to live in a much softer universe will create. We only need to look at Lorca for a clear example of this. This can be pinned down to an impulsive emotional reaction and I hope it develops along those lines but Georgiou accepting a warrior’s death as a defeated Emperor felt fitting enough as far as exits go. Of course this means we get to have more Michelle Yeoh in the coming episodes so that almost makes the conceit acceptable on its own. One thing this episode does well is promote the Star Trek idealism at the root of all of the character motivations. When fighting Lorca Burnham practically pleads with him that all he had to do was ask for help returning to his own universe and that help would have been granted. She proudly states that it’s what Starfleet stands for and it’s who she is. It’s a powerful statement because it highlights the difference in values between the Humans and the Terrans. The Terran philosophy is all about conquest and subjugation where the Human philosophy is about peaceful exploration. Lorca’s point of view on the Federation is that it’s a social experiment doomed to fail because his life experience has indoctrinated him into that point of view where Burnham’s life experience indoctrinated her into the point of view that the opposite is true. I use the word “indoctrinated” very deliberately because both universe employ their own version of social engineering as any society does so the question is over which viewpoint is more realistic. This episode represents both and comes down on the side that the Star Trek idealism will win. This is reinforced by the scenes set aboard Discovery giving a very clear example of which way of thinking is the better one. The Terran Empire are destroying the Mycelial network by using it as a power source and putting all life in every universe at risk. Throughout this season we have seen the Discovery crew study the network, experiment with it but ultimately respect it which makes for a clear difference between the two universes. Mirror Stamets’ experiments are destroying life so the Terran outlook is destructive where the Human/Federation outlook is the complete opposite. This simplifies the argument without doing away with the complexity. The scenes on Discovery are the first time for me that the crew has actually felt like a crew. Saru really comes into his own as a Captain in this episode proving himself to be fair minded, respectful and motivating. His speech to the crew about not sensing the coming of death, trusting them to find another way and not accepting the no win scenario is the absolute highlight of the episode. It’s a speech that could have come from James T. Kirk himself and gives the finale of the episode an undercurrent of optimism that many would argue has been missing from this show. It is bizarre that there is barely a reaction to finding out their Captain has been a fraud this entire time but Saru saying that the Discovery no longer belongs to Lorca and calling this mission its maiden voyage is suitably inspiring. 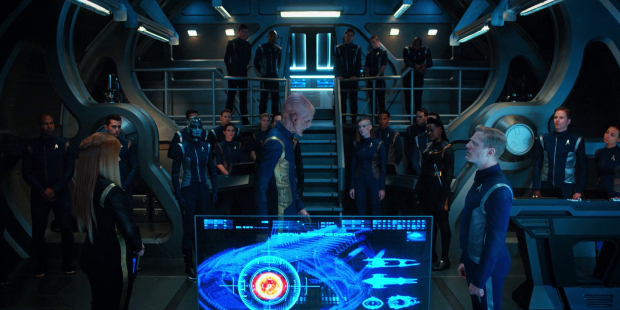 Saru facing off against Lorca on the viewscreen also shows how capable Saru is when tested. 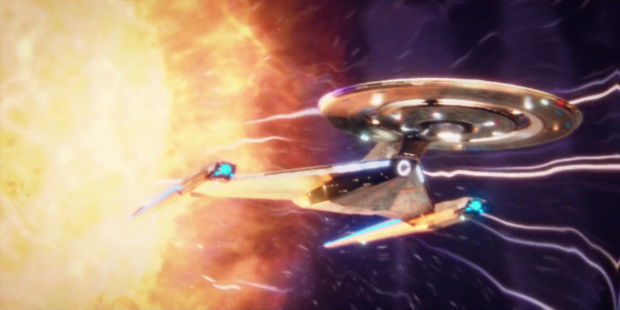 There was something traditionally Star Trek about the way the crew of Discovery worked together to solve the problem. Most of the focus was on Stamets, Tilly and Saru as has been the norm on this show so far but the rest of the bridge officers are there and they are encouraged to offer their own contribution to the situation. Everyone is pulling together using their talents and knowledge to find a unique solution to an impossible problem. It’s impossible not get caught up in the sense of adventure projected in these scenes and it could mark a welcome change in tone as the show moves onto something else in its second season. It wasn’t all perfect. The solution to the problem was fairly technobabble heavy though this is offset to some degree by arriving at the solution being grounded in the characters. It doesn’t fully excuse the confusing talk about Warp Bubbles and the like and it does feel like the solution comes from nowhere but Stamets and Tilly arriving at this conclusion together makes it more character driven than MacGuffin driven which definitely counts for something. 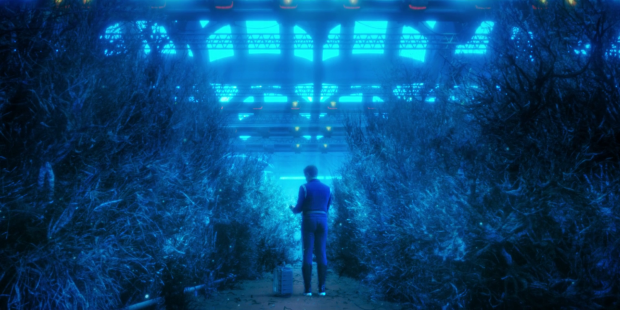 The destruction of the Emperor’s ship and seeing the navigation of the Mycelial network through Stamets’ eyes was visually impressive while being grounded in Stamets’ experiences as he puts together all of the cryptic information he has been drip fed over the course of the season. It doesn’t entirely work but it’s clear enough that Stamets has learned from his experiences which makes it a lot easier to follow. Star Trek: Discovery loves a shocking reveal so naturally another one ends the episode. They find themselves 9 months in the future when they return to their own universe and it turns out that the Klingons have won the War setting up the arc that takes us up to the end of the season. Once again it’s a shocking reveal which almost feels routine by this point and it’s a story that can’t end in anything else but a reset button. This idea has been set up by them being thrown out of time by the Mycelial network in the first place so I suspect the next two episodes will have them play around with another dark “What If?” scenario before resetting the timeline to at least the point that they left if not all the way back to the start of the War. I certainly hope it isn’t the latter. There are still a couple of lingering plot threads to be dealt with such as what the I.S.S. Discovery got up to in our universe and if it’s still there. It’s possible that they are responsible for the Klingons winning the War. The question of what happened to Lorca’s counterpart is still unanswered as well though the implication is that he’s dead. Lastly there is clearly something being set up with the green spore that is absorbed by Tilly so there is some potential yet to be explored. An entertaining episode that chooses style over substance in most of the key areas. The Lorca reveal was nicely handled in the previous episode but amounts to little more than turning him into a moustache twirling villain participating in a rivalry that we as viewers aren’t invested in. It’s important to remember that Georgious doesn’t exactly come across as the good guy but for the purposes of this episode she becomes that and Burnham builds a relationship with her based on the relationship each of them shared with their duplicates. It’s fairly weak as motivations go and fails to explore the scope of the issues. The setup does allow for some interesting and creative action sequences as well as a visually impressive death scene for Lorca but it’s little more than entertainment with a lot of wasted potential. The scenes set on Discovery were great in terms of showing the much celebrated Star Trek idealism as well as developing the group as a functioning crew. Saru really steps up as Captain and delivers a James T. Kirk worthy speech about pulling together to accomplish the impossible. The solution to the problem is a little technobabble heavy but is very much grounded in the characters who solve the problem together so that excuses it somewhat. The cliffhanger ending makes for another shock reveal in the recent history of shock reveals and can only result in some form of reset button. Hopefully it plays out in interesting ways but the setup isn’t that strong.